"Um, somebody should tell you guys that Mother's Day was last week.."
Yup, that's what you're thinking. 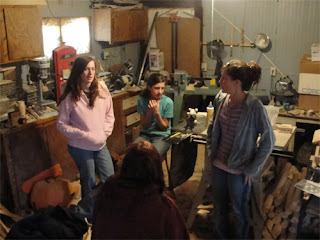 Actually, our mothers are not forgotten or neglected around here.. Not this year, anyway. See, when Kryzdy was visiting, she motivated us to make this year's Mother's Day just a little extra special with a few homemade gifts. However, we couldn't post about it then, as it would ruin the surprise for Kryzdy's mother who had to wait for her gift to show up in the mail! But now, we have clearance to show 'em off... 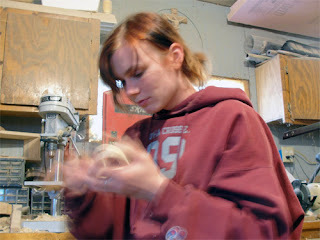 Here is Kryzdy, whittling away so fast that her hands are a blur! She does work quick, but despite her best efforts she only managed to nick herself once with the knife.. 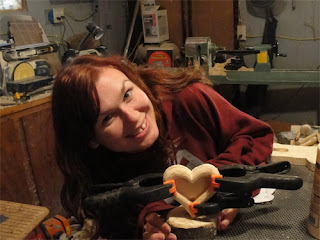 Showing off the new rustic heart-shaped picture frame on a stand, all glued up and drying. You can just barely see the little slot on the top for sliding a picture in. A very unique gift, and she thought it all up on her own! 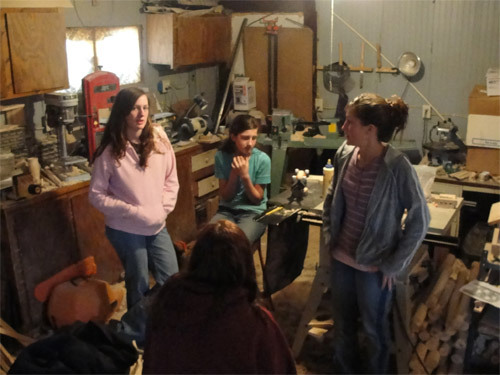 Discussing our plans with the committee (it's important to get family approval on these things)..
For our own mother, the gift required a bit less thought, but perhaps a bit more tedious work. See, she happens to be quite the word game aficionado.. One of her favorites is Boggle. 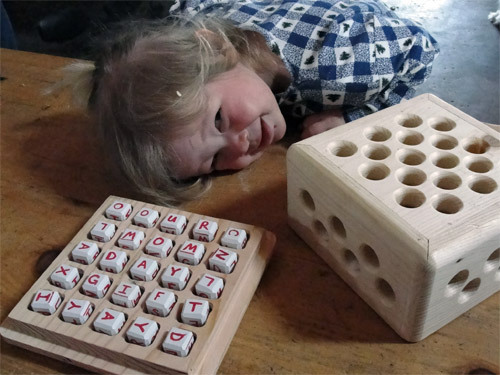 Our "Big Boggle" set had to be discarded many years ago, leaving us with the typical 4x4 Boggle, which simply doesn't offer enough 4-sylable words for my mother.. ;-) The larger 5x5 Big Boggle is harder to find these days, and we decided that a homemade version would make the perfect gift! So, here it is--graced by our young model. Can you find the secret message..? For those of you unfamiliar with "Boggle", just stick the top on, shake up the letter cubes and jiggle the tray until they're all flat. Then race your opponents to find words--up, down sideways or diagonal.. Anyway, there you have it. No more secrets.. Thanks for the motivation and help, Kryzdy! Totally awesome you guys!!!! Your Mom is blessed with many blessings!! !